Kiva’s pay will increase 19 percent over the life of the contract — rising $2.30 an hour to $14.50 an hour. That’s roughly $4,800 more a year, which will give Kiva a much firmer foundation on which to build a home for herself and her two boys. Kiva Robbins has worked at Johns Hopkins Hospital for 12 years, but she makes just $12.20 an hour. It’s the kind of wage that makes raising two sons a struggle. For years, Kiva, an environmental services worker, has relied on food stamps and other public assistance to supplement her Hopkins pay. But even that hasn’t been enough to make ends meet. 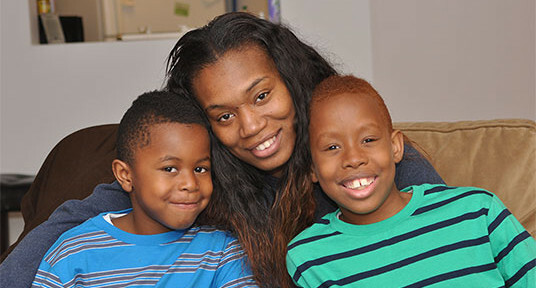 Last fall, Kiva and her two boys had to give up their apartment when the rent was raised, and for now they’re doubled up at a relative’s modest apartment. The cramped conditions mean Kiva’s sons, Kevin and Kyree, don’t have a bedroom to sleep in. “The things you want to do for your family, you just can’t do it on Hopkins pay,” Kiva says. And while the pay is too low, the healthcare costs at Hopkins are too high. Kiva, like many workers at Hopkins, can’t afford the hospital’s family health plan. So even though she helps provide world-class care, she can’t afford to get braces for her son. Altogether, 74 percent of the roughly 2,000 union workers at Hopkins make a wage that would qualify a family of four for Medicaid. Nearly 70 percent of the caregivers are paid a wage that would qualify a single parent and child for food stamps. Kiva wants to move her boys to a home outside the city, so they won’t be exposed to some of the tough neighborhoods she grew up in. But last year her car was repossessed, so she doesn’t know how she’d make the commute back to Hopkins. It’s the kind of dilemma that many Hopkins workers face — the kind of dilemma that would be much easier to overcome if Hopkins workers had a fair wage. “We’re just asking for two or three dollars, so our kids can have a home,” Kiva says.